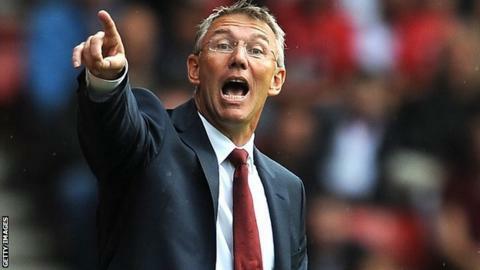 Southampton boss Nigel Adkins has said speculation over his future at St Mary's does not affect him. Last season's Championship runners-up are without a win in the Premier League so far this season. Adkins insists that his relationship with Southampton chairman Nicola Cortese is solid. "It doesn't affect me," he said. "I don't read the newspapers. I've got a great working relationship with the chairman here." Reports in the media earlier this week suggested that Southampton were ready to replace Adkins, 47, with former Liverpool manager Rafa Benitez. Southampton suffered a 6-1 defeat away to Arsenal in their last outing, but Adkins is unconcerned about speculation over his position. "I think if you're looking over your shoulder thinking 'Well, if I don't win this one' your mind is going to be affected in different ways, so I don't even think about that." Adkins was appointed by Cortese in September 2010 when the club were in League One, and subsequently guided them into the Premier League via back-to-back promotions. "We have an excellent working relationship and we share the same common goal; we want Southampton Football Club to do well," added Adkins. "We know there needs to be stability, we know there needs to be support. We drive each other on. There is nothing wrong with that."